This was hands down the best book I read last year! It's a true story of the friendship between a little boy who begs on the streets of NYC and a businesswoman. The story is so heart-breaking and touching--there were several nights that tears were streaming down my face as I read this. It made me realize that I am so unaware of the poverty that grips the lives of so many here in the U.S., and also how even the littlest things can have the biggest impact. If you're into food memoirs, definitely read this one! 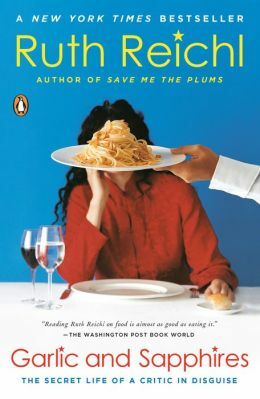 Out of all of Ruth Reichl's books, this one is definitely my favorite. The disguises she develops and wears for the restaurants she tries and reviews are hilarious! This book is also where I found one of my favorite quotes about cooking that I shared here. I have previously posted about this book, and it ended up being one of the most fascinating books I read last year. It gives a glimpse of what life inside a federal women's prison is like--the friendships that develop, how the women spend their time, the dynamics between the guards and the prisoners, etc. Most of the books that made this list were non-fiction, which is unusual for me. I just wasn't a big fan of the fiction that I read last year - except for this book. It was SO good! It was beautifully written, it was thought-provoking, and the story was unique and not as predictable as many books are these days. This was one of those books that I couldn't put down because I was so drawn into the story and the characters. My favorite cookbook from this year, and one of my all-around favorite cookbooks! Joy is awesome. She makes delicious food and writes funny and clever things. I have enjoyed working my way through this cookbook and several recipes have become repeats already! This was my favorite "coffee table book", if you will. Emily's blog is my favorite blog, and her book is like an entire year of posts in one big chunk. The book is divided by seasons of the year, so the fashion and beauty tips for that particular season are right there with season-appropriate recipes and decorating ideas. I love Emily's approach to entertaining and decorating, so I found her book to be really inspiring. So what were some of your favorite books that you read last year? Have you found that your preference in books shifts over time? Blackberry Winter and The Bungalow by Sarah Jio were two of my favorites! Yay!!! So glad you liked Kerman's book!!! That was one of my favs too. Right now I'm reading White Girl Problems....sometimes I need a mindless book to read and this is definitely that and completely hilarious! thank you so much for this list! all of these sounds like great reads, but i am absolutely reading the first one you mentioned. i've had joy's cookbook on my list of books to get for awhile, i really need to make it happen in 2013.
i've seen moonwalking with einstein and thought it looked interesting...maybe i'll have to read it. my fave read of this year was definitely the great gatsby! i can't believe i have to wait til summer to see the movie! Your nonfiction picks sound fascinating - adding them all to my Amazon list. The most memorable book I read was 50 Shades of Grey (tho definitely not the best!) and I'm excited to read Gone Girl next. I'm working on making my book list over the next couple of weeks, so I'll be adding some of these to it. I like to read a variety of genres throughout the year. My favorite last year was Envy of Eve--definitely recommend it. Are you going to share your 2013 book list? I'd love to know what you have planned for this year. ooh sherri lynn these book suggestions are awesome! i definitely want to read orange is the new black that really does fascinating like Alexa said! I really liked Garlic & Sapphires too. My bf hated it though! He felt that Reichl was condescending and pretensious. I think it rubbed him wrong that she was so flippant about working at the NY Times, haha. It was interesting to see it from a different point of view though. I want to eat Joy's entire blog!